Calvin & Hobbes is one of the greatest comic strips ever put to paper (or digital memory), and if you don’t agree with that, then I’m going to send Spaceman Spiff over to blast you with his Atomic Napalm Neutralizer. The impact that the adventurous and introspective strip has on people is still growing, and may be stronger now than ever before, since the nostalgic fondness of older readers is now competing with a rabid appreciation for the strip from fans that weren’t even born when creator Bill Watterson surprisingly decided to pull the plug back in 1995. The above trailer for Joel Allen Schroeder’s upcoming documentary Dear Mr. Watterson expresses that all-encompassing fandom pretty well, and I’d like to hop into my time machine/cardboard box) and shoot forward to the film’s theatrical and VOD release date of November 15. Schroeder, who has no relation to the piano playing smart guy in that other legendary comic strip, conceived the project years ago, and funded it through Kickstarter, first back in 2009 and then again in 2012, as the film had gotten much bigger than he could have ever anticipated. It shows onscreen with the number of interviews and talking heads that pop up. He started filming simple fan interviews back in 2007, and while I’m sure there was no shortage of people to talk to in that capacity, he was soon able to up his game and talk with comic strip creators like the amazing Berkeley Breathed (Bloom County, Outland) and Stephan Pastis (Pearls Before Swine), along with Bill Amend (FoxTrot), Jef Mallet (Frazz), Jan Eliot (Stone Soup), Keith Knight (The K Chronicles) and Dave Kellet (Sheldon). He also met with folks from the Cartoon Art Museum and the Toonseum, along with professional poker player Lee Salem and actor Seth Green. Here’s a surprise: they all really, really love Calvin & Hobbes. I really can’t wait to see this doc, but I wish it had more of a bite to it beyond just featuring a bunch of people gushing over the eccentric and elusive genius that is Bill Watterson. I’m not asking it to subvert a childhood love like Escape From Tomorrow did with Disneyworld, but the excellent book Looking for Calvin & Hobbes: The Unconventional Story of Bill Watterson and his Revolutionary Comic Strip by Nevin Martell already delved into the widespread comic obsession, and with many of the same interviewees. But it wrapped its slight narrative around an attempt to figure out who the privacy-minded Bill Watterson was as a person by talking to members of his family and old friends. 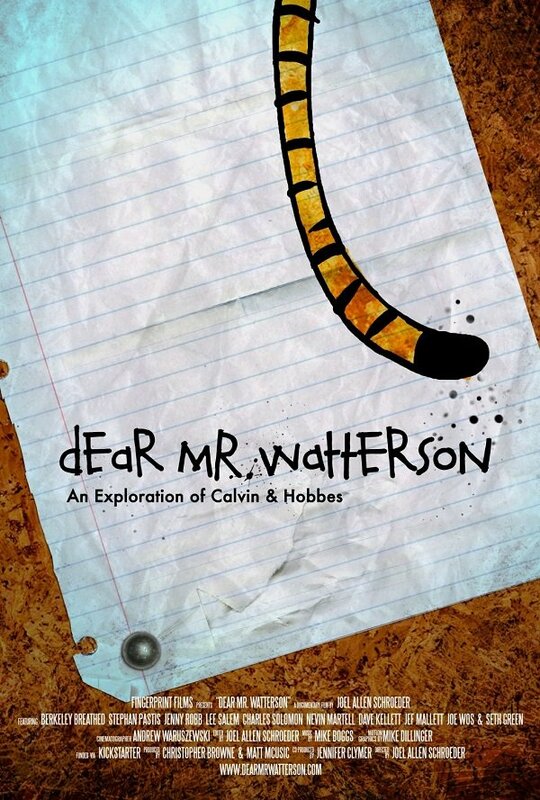 I’d initially thought this doc would be doing that, given the title, but “Dear Mr. Watterson” turns out to be the beginning of an unfinished letter Schroeder wants to send him. Does it matter? Not really, as this is still one of the most worthy endeavors a filmmaker has ever taken. Even if it was just feature length slideshow of comics without any other angle, it would still be worth the money. According to the preorder information on the film’s website, it looks like the DVD and Blu-ray editions of the doc will be available a month or so after its November 15th opening.